Last week saw one player win 70ETH! Are you in the week’s list of biggest winners? 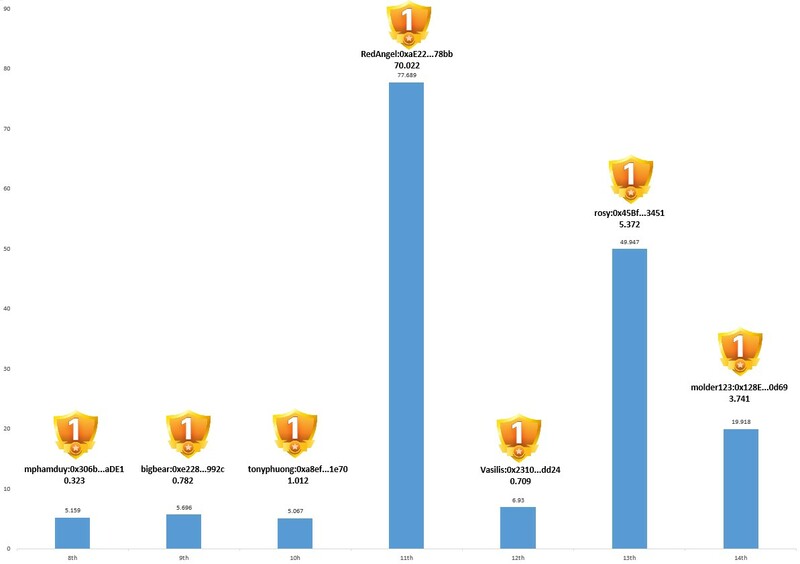 It was an amazing week for CryptoDozer players, not only did we give out a great amount of ETH to all our players but one player hit the big time! Even if you weren’t the big 70ETH winner, we really hope that, you’ve been having fun playing CryptoDozer and that you’ve been earning ETH. We have another week’s worth of top players to share with you. So without delay, let's give a massive round of applause to the best players of the week. Our first player, mphamduy did well, netting 0.323ETH. Then bigbear got a big 0.782ETH on Tuesday. However, the star of the week and blowing everyone out of the water was, of course, RedAngel with the legendary — almost unbelievable — 70ETH win! Everything else after that just looks small, but Vasilis, rosy & molder did amazingly well, taking up the end of the week with a combined 9.822ETH. This was by far the biggest week of ETH rewards for CryptDozer. Let's hope next week is even better! Big news & big ETH in our first month! CryptoDozer lets you earn real ETH by collecting cute CryptoDolls, it’s a super simple game that has some serious ETH. Our CryptoDolls have a range of values and rankings, including Fancy, Bronze, Silver & Gold! With ETH value reflected accordingly. Our Silver CryptoDolls are worth up to one ETH while our Gold CryptoDolls can be worth two, seven, 10 and even 30ETH. Then there’s the ultimate prize, a special 70ETH CryptoDoll! Winners of these CryptoDolls really will be the ultimate Crypto Rich. Can you collect the ultimate prize?